As the world grows smaller, our common humanity will reveal itself. If they are lucky enough to attend school, today’s six year olds will graduate in twelve years, in 2023. The pace of technological change is so astounding, how can we know what 2023 will even look like? Consider for a second life twelve years ago. In 1998, internet access in global terms was slow, narrow and novel. Today it is fast, broad and approaching potential ubiquity. In education, how do we prepare children for a world we cannot predict? What should education be when information is just a few clicks away? They will need twentyfirst century skills to succeed: information literacy; critical thinking; and a capacity to innovate and create. Addressing these issues, One Laptop per Child (OLPC) is a global, non-profit organisation dedicated to creating educational opportunities for the world’s poorest children. OLPC views education as the key to overcoming poverty, and as the creator, manufacturer and distributor of the ground-breaking XO laptop, it works with governments and educators to supply rugged, low-cost, low-powered, connected laptops, loaded with educational software, to children in developing countries. The brainchild of researchers and educators of MIT’s renowned Media Lab, designed especially for children aged six to twelve years old, the XO is a special object. Unveiled at Davos in 2005 as the ‘hundred dollar laptop’, it became an instant icon of twentyfirst century design, a landmark in computer innovation, the epitome of disruptive economics, and a symbol of hope to millions of children across the developing world. The XO has been in the vanguard of a global revolution in bringing information and communications technology into the classroom (of which Australia’s own ‘Digital Education Revolution’ is a largely unacknowledged lamplighter). 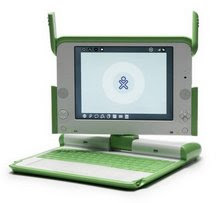 OLPC is designed to be a national program mainstreamed into the education system and more than two million XOs have been distributed in over forty countries, including Uruguay, Peru, Pakistan, Palestine, Nepal, Haiti, Rwanda, Afghanistan and remote Australia. OLPC also adopts the ‘one-to-one’ approach whereby every child is given their own device to keep, take home and share with their families and community. Giving every child a device is analogous to an inoculation against exclusion from the ‘digital divide’– that gap in equitable access to the internet and the digital domain between rich and poor countries, and between the rich and the poor within all countries. Progress on bridging these gaps is now widely accepted as a key indicator of human development. Now the XO has come to the Pacific. In 2011 there are more than 6,000 children with XO laptops in forty-one schools in ten Pacific Island countries: Cook Islands, Federated States of Micronesia, Nauru, Niue, Papua New Guinea, Samoa, Solomon Islands, Tonga, Tuvalu and Vanuatu. what should education be when information is just a few clicks away? One Laptop per Pacific Child is a regional initiative to provide an XO loaded with appropriate Pacific content and open source software to every Pacific child in basic education. We are seeking to reach more than 700,000 children in schools across twenty-two Pacific island nations, a goal that acknowledges just as many children attend no formal schooling whatsoever. A coalition of partners called OLPC Oceania is linking individual country programmes to region-wide technical assistance. In January, the tiny Micronesian state of Kosrae took possession of 800 XO laptops, enough to cover more than half the island’s senior primary school population in years 4, 5 and 6. A key task Kosrae’s educators have set their students is to adapt the operating system of the computer into the native Kosrean language, in time for next year when grades 1, 2 and 3 will get their laptops. This will have a positive impact on this cohort’s lifelong economic prospects, but we won’t start to see the results until the 2020s when many will embark on twentyfirst century careers that their parents would never have imagined possible. Similar stories are being written all over the Pacific, and while heartwarming at first blush, these are but baby steps for the region, dwarfed in scale by deployments elsewhere in the world, such as Latin America, where in Peru alone there are some 870,000 laptops in use. Why has the Pacific take-up been slow? It hasn’t been for lack of political will. In 2007, the leaders of twenty-two Pacific nations publicly resolved to test the XO in their primary schools and education systems. National leaders of ten Pacific countries have made explicit formal requests for support from donors to support their government to introduce OLPC. As OLPC’s Pacific representative, I have been petitioning the donors to listen. If country demand is strong, it’s because the needs are enormous. In 2011 the people of the Pacific face challenges arising from poverty, climate change, globalisation, natural and human-made disasters, rapid population growth and increasing rates of urbanisation. These forces are impacting the natural environment, traditional cultures and practices, food security, local markets and livelihoods, communities and families. In wealthy, developed Australia we forget that six of the world’s fifty designated ‘Least Developed Countries’ are right in our ‘backyard’: Kiribati, Samoa, Solomon Islands, Timor-Leste, Tuvalu and Vanuatu. An unskilled worker in the Solomons takes a week to earn what an unskilled Australian earns in an hour. In Kiribati, a child’s first birthday is the most celebrated milestone, since so many fail to meet it. Many small Pacific economies face long-term if not permanent dependence on foreign aid and remittances from expatriate diasporas. If donors fail to equip Pacific children to meet these challenges we put them at an even greater disadvantage. We will be handing the baton to a new generation less able to support and raise their own families, and more vulnerable to social disintegration. As adults, they will risk being left behind, a destructive legacy they will pass on to their own children. However Barack Obama’s quote reminds us that there are options. We can choose to help the children of the Pacific secure their future. We can give a child a laptop today which can extend her education, broaden her knowledge, expand her skills, and unlock her creative potential. Here in 2011, at a time when Australia rolls out a Digital Education Revolution, the question is not whether laptops for Pacific children are appropriate, but whether we are going to be early or late in supplying them. -- Michael Hutak is Director, Oceania, One Laptop per Child Foundation. First published by St James Ethics Centre.